Are you thinking of buying a new smartphone? Etisalat offers 1.5GB free data when you buy a new smartphone from Etisalat experience center or authorised phone retailers in the open market. You also get free access to social media and chat apps for 11 months. You will be given 100% bonus on every Etisalat data plan you bought for the first 6months of activation and 50% bonus for another 6months. In this post, I will show you how to activate your new smartphone for this offer. Here is how to get the offer. First thing you need to do is to buy a new Smartphone either from Etisalat experience center or from authorised phone retailers. 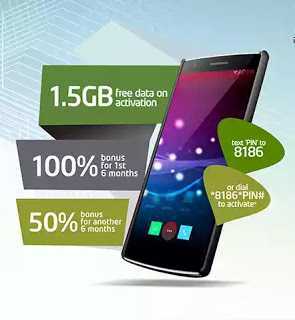 Insert an Etisalat registered and activated sim (new or old sim) in your newly bought smartphone. Look for the Etisalat promo PIN. You can find it in the phone box or under the offer sticker. Send the PIN to 8186 or dial *8186*PIN# for smartphones bought from the Open market. If you buy your smartphone from Etisalat experience center, they will activate it for you there. Upon successful activation, you will receive 1.5GB free data to browse and chat for 30 days. You will also be entitled to 100% bonus on any data plan you bought for the first 6 months and 50% bonus for the second 6 months. You don’t need to buy any Etisalat SocialMe Pak plan when you activate this offer. You will be given free SocialMe data the next month, after you buy up to N1000 data plan. Note: This offer is only available for newly bought smartphone. You can buy the smartphone from Etisalat experience center or from any authorised phone retailers in the open market nation wide. When buying from the open market, check whether the phone has Etisalat promo pin before making any deposit. You can use Etisalat new or old sim for this offer.